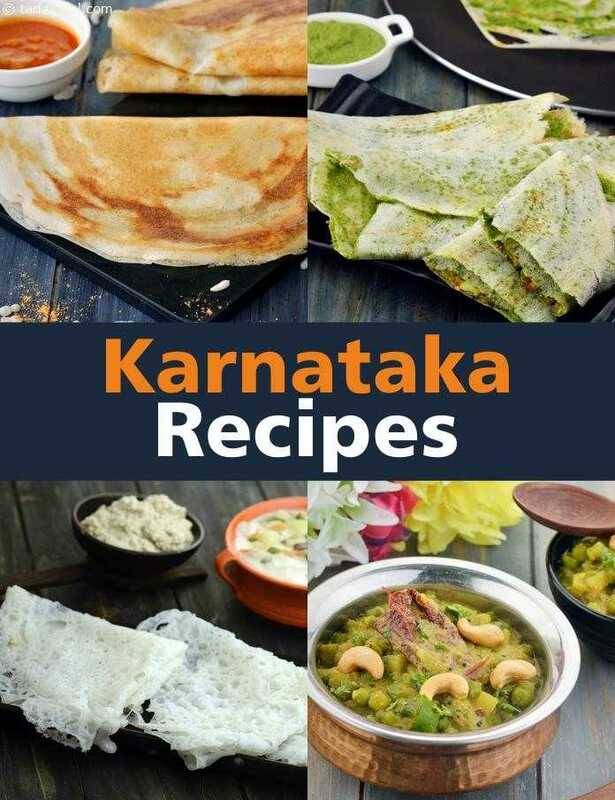 We have a large collection of 32 different types of Karnataka Recipes or Veg Recipes from Karnataka. Like most Indian states, Karnataka also offers the diner varied foods, with different distinct flavours. Although woven by a common theme, each region has its own characteristic taste and special items. Mangalorean cuisine is different from Udupi, which is different from Mysore, and the experienced foodie can easily tell the difference! Mangalore offers the diner tongue-tickling curries, jackfruit papad, and other awesome dishes with a coastal touch. The balanced use of coconut, spices and kokum gives their dishes a rich mouth-feel and exciting flavour. Mysore is known for its Mysore Masala Dosa and Bisi Bele Bhaat, while Udupi is famous for its authentic Kannadiga sattvik food. Veg Recipes of Karnataka, how Masala Dosa was discovered in Udupi? At one time, life in the temple city of Udupi revolved around the activities of the Udupi Krishna temple and math, and there were many experienced cooks who prepared offerings for the temple. The whole town was known for its authentic food, which was sattvik yet mouth-wateringly tasty. The recipes were passed down the generations, and gradually many gourmets from the town went on to set up restaurants in other parts of India. Although their cooking methods and recipes have been adapted over time to suit a larger audience, they still maintain their standards of purity, and in South India, the term ‘Udupi Hotel’ is used colloquially to refer to a pure vegetarian restaurant! There is also one more story I’ve heard from my friend about the origin of Masala Dosa. Usually, most snacks in Karnataka are served with a potato subzi called saag. Udupi being a temple town, the people do not usually consume onions or garlic. However, as the youngsters travelled to other parts of the country, they developed a taste for onions. Since they wanted to serve it in their own town without inviting the criticism of the orthodox elders, they started wrapping the potato-onion masala inside the dosas, by way of hiding it! Thus was born the Masala Dosa that is now famous all over the world. Idlis and Dosas are very famous in Karnataka too. In most parts of Karnataka, the dosa has a special texture, because it is cooked only on one side without flipping over. This makes one side super-crisp and the other side slightly spongy. Benne Dose, or dosa cooked with butter, is also a classic recipe of Karnataka, as is the chutney-laced Mysore Masala Dosa. A unique recipe from this state is the Neer Dosa, a rice-based dosa that is pure white, super thin and awesomely tasty. It has a characteristic texture that is soft and slightly chewy. Its soothing taste is also a treat to the palate! It may be served with chutney and sambhar, but traditionally it is served with one sweet and one savoury accompaniment – that is, a mixture of grated coconut and jaggery, and a special potato curry called Sagu. Rava Idli, a quick and easy idli made with semolina, is also very famous in Karnataka. This too, is served with Sagu. Kotte Kadubu is another Kannada version of idli, which is steamed in turmeric, banana or kewra leaves. This gives the idlis a superb aroma. Chow-Chow Bath is a Kannada delicacy that has an attractive name, which never fails to kindle a newcomer’s curiosity! Chow-Chow Bath is a classic sweet and savoury combo served at most Karnataka restaurants. It includes one portion of Kesari Bath (a sheera-like sweet made of semolina and fruits like pineapple or chickoo) and one portion of Khara Bath (a spicy version of semolina upma)! These dishes are had for breakfast and for dinner. Some restaurants also serve these in the evening, from 4 p.m. upwards so they can be enjoyed with the evening cup of coffee! A regular Kannada meal consists of vegetable preparations, a dal based preparation like Sambhar, and Rasam (known as Saaru in Kannada). When it comes to curries, Mangalorean cuisine tops the charts. They have a wide range of unique and totally mind-blowing subzis, like the Drumstick Curry, Valval, Ripe Mango Curry and Ghassi. Kannadigas also love gojju, a gravy like preparation that has a unique blend of sweet, spicy and tangy notes. It can be made with veggies and fruits, such as bitter gourd or pineapple. Gojju is served as an accompaniment with any meal, and is sure to add a lot of excitement to it! Saaru, Saar or Rasam is also a must-have. In some regions it is made with tamarind, while in some places they use kokum. In general, the Kannada rasam has a tempestuous flavour that is sweet as well as spicy! It is sure to shake awake your senses. Bisi Bele Bath, a hot and spicy rice preparation, made of rice, dal and veggies flavoured with a special masala and tamarind pulp is one of the all-time favourites Veg Recipes of Kannada. It is enjoyed any time of the day, for breakfast, lunch or dinner! We Indians love our evening snacks, don’t we? Be it a wholesome and sumptuous tiffin like the Mysore Masala Dosa or Nachni Dosa, or a quick bite like the Bonda, snacks help get the better of your hunger pangs in a rather tasty and exciting way! Kadubu is one of the special snacks of Karnataka. These are steamed rice flour dumplings, with sweet or savoury stuffing. Kadubu is prepared during festivals, but also enjoyed as a snack once in a while on normal days too. Depending on the time and the circumstances, the snack might be light or heavy. Kids back from school would like something heavy with a cup of milk, while elders on the way back from office might like a quick bite with a cup of coffee or tea! Its dense coffee plantations are the pride of the State, and so the folks of Karnataka sure love their cup of filter coffee! In some parts of the State, Bella Coffee – that is, coffee sweetened with jaggery instead of white sugar – is very popular. So on and so forth, every nook and corner of Karnataka has a culinary tale to tell and a treasure to share. While the journey is endless, you now know where to start. Why not try some of these classic Karanataka recipes in your own kitchen, right away?